Couples staying at home and dining in for Valentine’s Day this year may enjoy some of the heart-shaped treats being offered to-go by Baskin-Robbins, Dunkin’ Donuts, Great American Cookies and Jet’s Pizza for 2015. Jet’s Pizza is bringing back its heart-shaped pizza again this year for Valentine’s Day. Jet’s heart-shaped pizzas will be available while supplies last on February 13 and 14, 2015 for delivery and carry out. The pizza consists of six slices, and a one-topping with premium mozzarella cheese costs $7.99 in Michigan while prices may vary in other locations. Customers can add a flavor to their heart-shaped pizza crust for no additional charge. Eight flavor options include butter, sesame seed, poppy seed, garlic, Parmesan, Romano, Cajun or Jet’s Turbo Crust. Jet’s Pizza says that its pizza dough and sauces are made fresh daily at every store. Jet’s heart-shaped pizzas can be ordered online at jetspizza.com or by calling a local Jet’s Pizza location. Special flavored heart-shaped donuts will be available again this year at Dunkin’ Donuts for Valentine’s Day 2015 as well as new flavored coffee and lattes. Cookie Dough and Brownie Batter heart-shaped donuts will be available through the end of February at Dunkin’ Donuts locations nationwide. The Cookie Dough heart-shaped donut features a “cookie dough flavored buttercreme filling, topped with chocolate dipping icing and chocolate chips” while the Brownie Batter heart-shaped donut offers “delicious chocolatey brownie batter flavored buttercreme filling, topped with chocolate dipping icing and a heart sprinkle mix,” according to descriptions provided by Dunkin’ Donuts. Other sweet offerings available through the end of February at Dunkin’ Donuts include White Chocolate Raspberry coffee and lattes. The lattes can be ordered hot or iced and come sprinkled with a special topping of red, pink and white hearts. Shoppers can find a local participating Dunkin’ Donuts at dunkindonuts.com. Baskin-Robbins has gotten in the mood for Valentine’s Day by announcing its February Flavor of the Month is Love Potion #31. Love Potion #31 is a mixture of raspberry and white chocolate-flavored ice creams with raspberry-filled chocolate flavored hearts, a raspberry ribbon and chocolate chips. The flavor is offered in a cup, cone, two-scoop sundae, or milkshake. A red waffle cone comes free with the purchase of any double scoop of ice cream nationwide at participating Baskin-Robbins locations. Conversation Heart Cakes are also available for Valentine’s Day in two sizes. A small Conversation Heart Cake is ideal for two people and comes covered with rainbow sprinkles while the Large Conversation Heart Cake serves 10 to 12 people with heart-shaped red, pink and white sprinkles atop its icing. 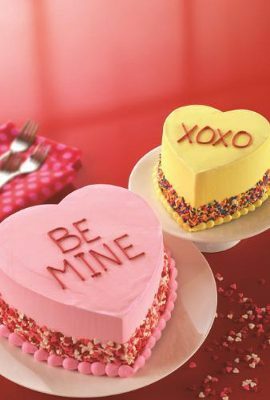 Baskin-Robbins’ Conversation Heart Cakes can be pre-ordered for Valentine’s Day in-stores or online at order.baskinrobbins.com. A local Baskin-Robbins shop can be found by visiting baskinrobbins.com. Heart-shaped cookie cakes are another sweet treat available for Valentine’s Day from Great American Cookies. The cookie cakes come in an array of shapes and sizes that can be personalized with a variety of colors, designs, and messages. Great American Cookies’ cakes can be pre-ordered in advance or purchased on Valentine’s Day and available for pick up “in minutes,” according to the company. To find a nearby Great American Cookies location, visit greatamericancookies.com. In addition to all of the heart-shaped food offerings for Valentine’s Day 2015, some companies and restaurants are also sponsoring sweepstakes and free giveaways through February 14, 2015. For a chance to win, learn more here. Tell us readers, will you be incorporating any heart-shaped foods into your meals for Valentine’s Day 2015? Staying in or dining out? Share your plans or any other heart-shaped food finds with us in the comments below! Heart shaped cakes and cakes with chocolate poured over them are great. Don’t forget chocolate strawberries also.